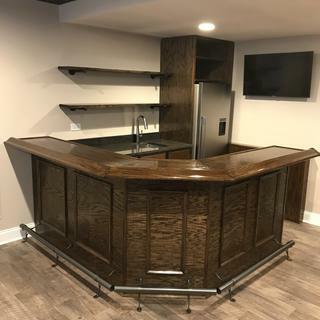 The favored form among many bracket enthusiasts, combination-style bar rail brackets rest a foot on a floor while an arm mounts to a bar facing. This outdoor-friendly Gunmetal Grey bracket, along with 2" metal tubing and other matching components, makes for a luxurious addition to any home or commercial bar. The durable grey finish of this combination bracket will precisely match your Gunmetal Grey two-inch outside diameter bar rail tubing. To install, use an electric screwdriver to attach the bracket onto the desired location of the tubing with the included set screw, then use the mounting screws to attach the bracket to the face of the bar. Be sure to measure precisely where to place the screws ahead of time. The production is very well made, good quality metal. It's a bit pricey though. The brackets are sturdy and the finish is good. The foot rail fits very snug inside, so you must be very careful not to scratch the rail upon installation. Matching screws are provided also. Overall a nice product. These rail brackets are very nice looking, great finish. Good hardware to assemble. a couple of the brackets had a slight swist to them but the brackets have some flex to them so it didn't cause much problems. Extremely easy to fit your rail into. I looked to build my own out of pipe hangers...etc. glad I didn't. Because it matches the granite counter tops on my bar. How far apart should my floor supports be of a 2" Foot rail? BEST ANSWER: Instructions say one at each end and one in the middle of an 8 foot length. My bar was 7' long so the three supports I used are a bit closer together and it seems more than sturdy enough. Caveat: No instructions provided on how to use the screws that go through the holes in the bracket to secure the rod. They appear to have a self-cutting tip, but it didn't come close to making it through the rod. I ended up using a tap to thread the holes and buying some set screws to insert. That ended up being more esthetic than having a screw head sticking out of each bracket, but took some extra work and tools. Ours was installed by our contractor and the supports are roughly 2' apart. They built the bar to the length specified, then divided the face side into sections using stiles. The corbels supporting the bar top are placed at the same distance, on the stiles....so it looked nice to have the supports for the foot rail line up with the stiles as well. The foot rail spans an area of three (3) 36" cabinets. The middle support is centered at 54". The end supports are approximately. 42" from the middle support. We highly recommend the foot rail otherwise my cabinets would be marked up. We would recommend no more than 4' max. We installed a 10' foot rail with 4 of those for extra support. My bar rail is 10 feet long. I cut three rail sections at 40 inches and used four floor supports. On a 4' rail--I put a floor support on each end, and then one support in the middle. Sorly, I thought it said 2 foot. . I spaced my supports every 3 feet.